All collectors love identified artifacts and of those that are, some seem particularly special and go beyond the norm. These are the artifacts pictured in books and talked about among fellow collectors at shows, clubs and roundtables. 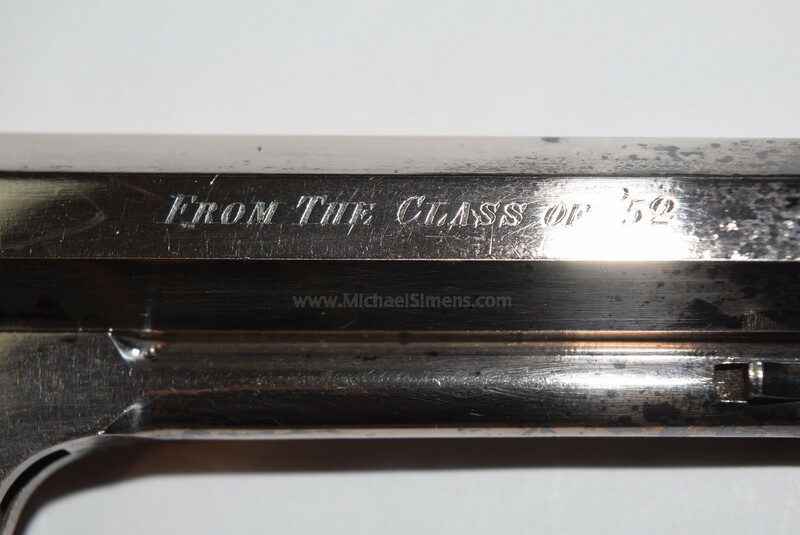 This 5" barreled Colt Pocket Revolver presented by the Harvard Medical School "Class of 1852" to a fellow grad, is such an artifact. 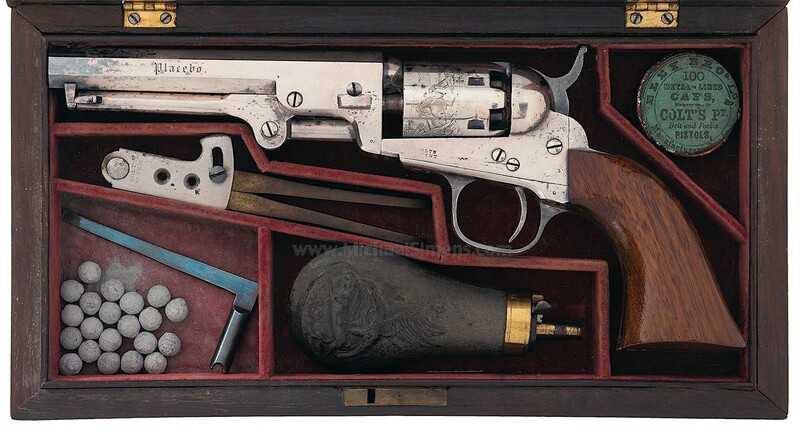 I have been collecting Colt Percussions for many years and have never come across such a gun. It is adorned with many unusual features, the first of which is its original silver-plating. It is housed in its original and beautiful factory rosewood case with inscribed lid escutcheon that reads; "Surgeon Hurd / 5th REGT. M.V.M.". The right side of the barrel is inscribed "S.H. Hurd, M.D. / SURGEON 5th REGT./M.V.M." / "FROM THE CLASS OF '52". The left barrel flat is marked "Placebo." 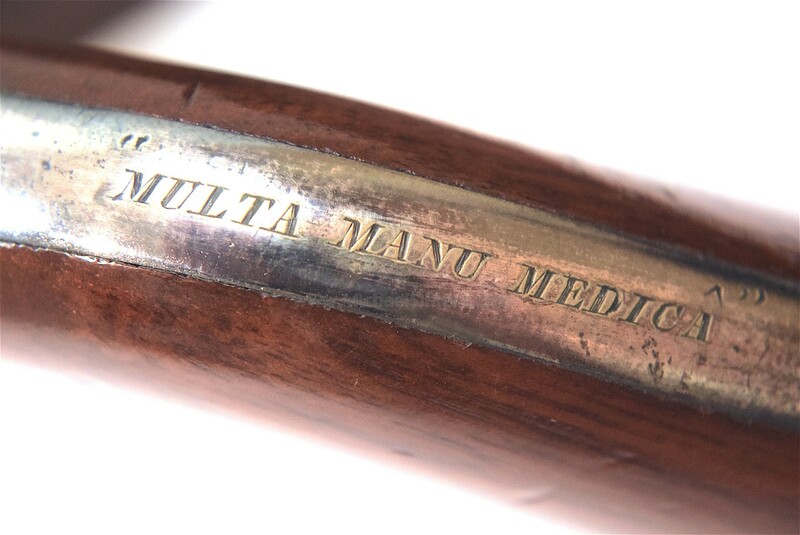 and the back strap is inscribed with the Latin phrase, "MULTA MANU MEDICA." 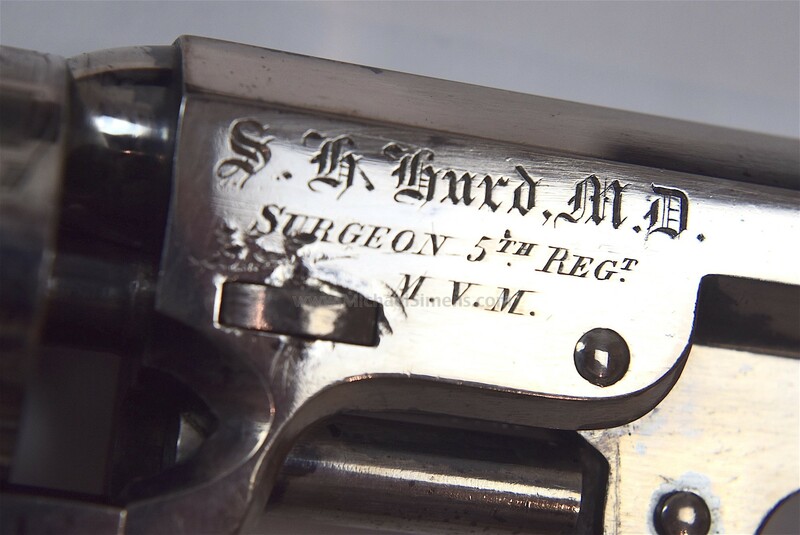 Additionally, the gun is accompanied with an unprecedented ORIGINAL LETTER OF PRESENTATION dated April 29, 1861 that reads, "Surgeon Hurd / Dear Sir, / The Class of ’52 desirous of showing their appreciation of your courage and patriotism in thus nobly and disinterestedly giving up ‘Home’, to offer your services to your Country, hereby transmit to you this revolver, which we hope will report favorably for the safety of our classmate and friend. / In behalf of the Class of ’52, Horace Richardson / Howard P. Arnold”. In all my years of collecting, I have never seen a Colt with such unusual inscriptions nor have I seen such an eloquent letter. I'm not a Harvard graduate, but I feel my research on these symbolic inscriptions allow me to offer some theories about this historic Colt. 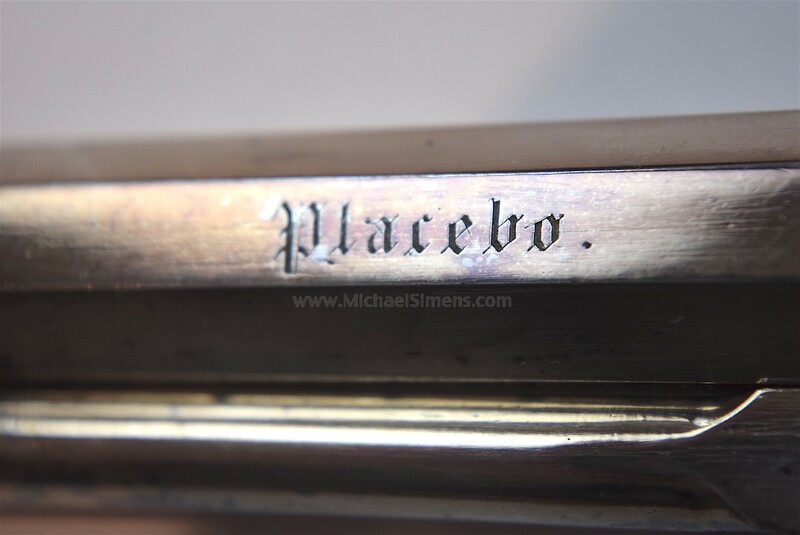 I am convinced that the inscribed word "Placebo" is an actual naming of the gun by the presenters. In Latin, a loose definition of the term means "I shall please" or "I shall satisfy". For the purposes of the presenters, I believe it meant "I shall deliver" or "I'll get the job done". Additionally in Latin, the phrase "MULTA MANU MEDICA" means "multiple things by or from a healing hand". I believe this means that the hand that holds the "Placebo", even if sworn to the essence of the Hippocratic Oath, "first, do no harm" is absolved of any violation when defending his own life and country. Surgeon Samuel H. Hurd served with the 5th Regiment of the Massachusetts Volunteer Militia from May 1 to August 1, 1861, participating in the First Battle of Bull Run on July 21, 1861. The "Minute Men" as they were called, lost nine men killed, two wounded and twenty-three missing. 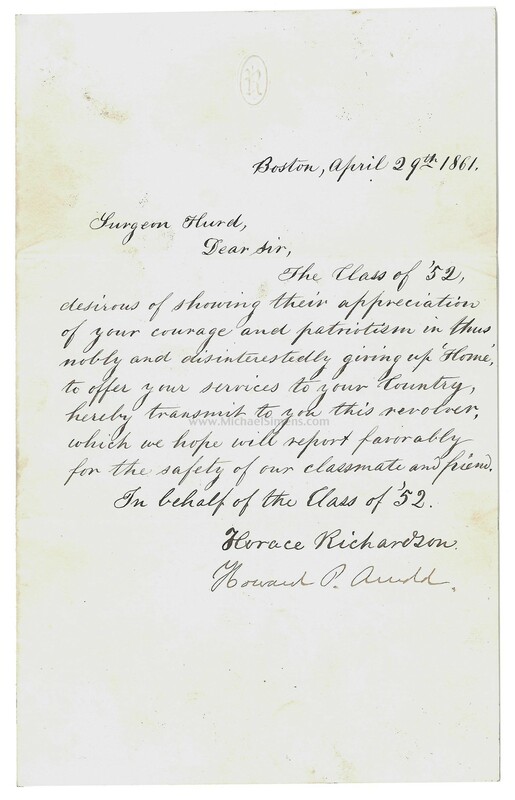 The regiment was mustered out of the service July 31 and thereafter Hurd treated the wounded as they returned to Boston, providing medical care for their families as well, for free. He went on to have an outstanding medical career. He lectured on “Medical Knowledge among Indian Tribes” describing the benefits of the “vapor bath” and citing some possible additions to the Pharmacopoeia from among their herbal remedies. He lectured on “The Human Skeleton”, was a member of the American Geographical Society and the New York Historical Society, and made donations of maps and documents to the historical societies of Kansas, Massachusetts and Wisconsin. 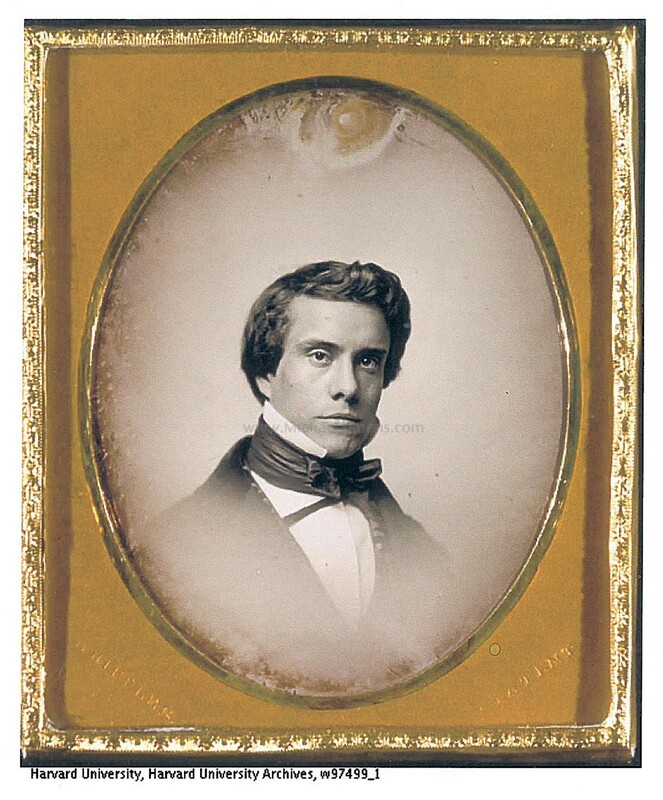 After his retirement from the practice of medicine, he and wife Lucy lived in New York City, visited Newport and Saratoga Springs, traveled abroad a great deal, and summered in Skaneateles. Here, Samuel Hurd fostered the village’s first society for the protection of song birds, even before there was an Audubon Society. He died in 1897, in Atlantic City. 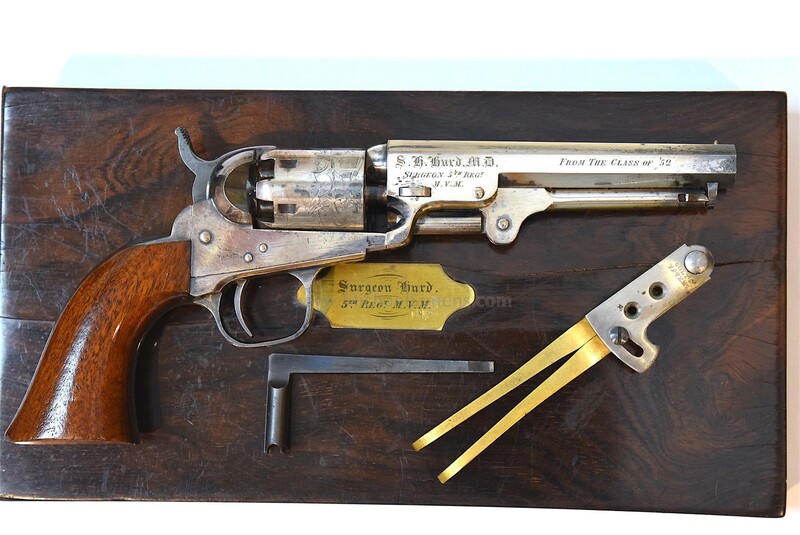 The gun, case and accessories are all in excellent condition and this set is an outstanding candidate for the finest collection, especially for those collectors who may be involved in the practices of medicine or health.